As Store Manager of Swenson Granite Works in Concord, NH, Dennis Ames has taken the lead on campus transformations across the state. Over the years, he has witnessed firsthand how a granite staircase can turn a standard building into an elegant learning center, how a stone patio can bring students together in a comfortable gathering space, and how a customized granite sign can leave a lasting impression on newcomers entering the gates for the first time. When he was first contacted about projects for The University of New Hampshire (UNH) School of Law, Ames was thrilled to showcase some of Swenson’s offerings at the local campus, which is located just over two miles away from Swenson Granite Works' Concord, NH location. 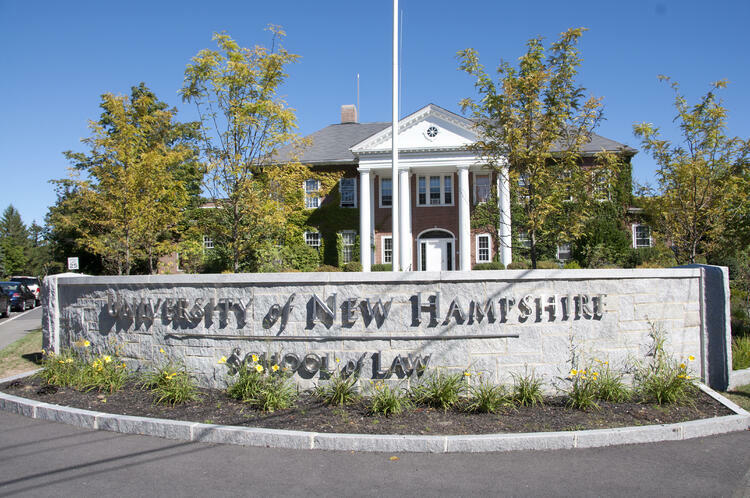 Already an attraction in itself, the University of New Hampshire School of Law is also across the street from White Park, which brings in thousands of visitors annually and is home to Concord’s popular annual Black Ice Pond Hockey Tournament. “It’s always important that every job gets done very well and to perfection, and there’s an extra sense of pride when we’re asked to do something locally in our town,” said Ames. 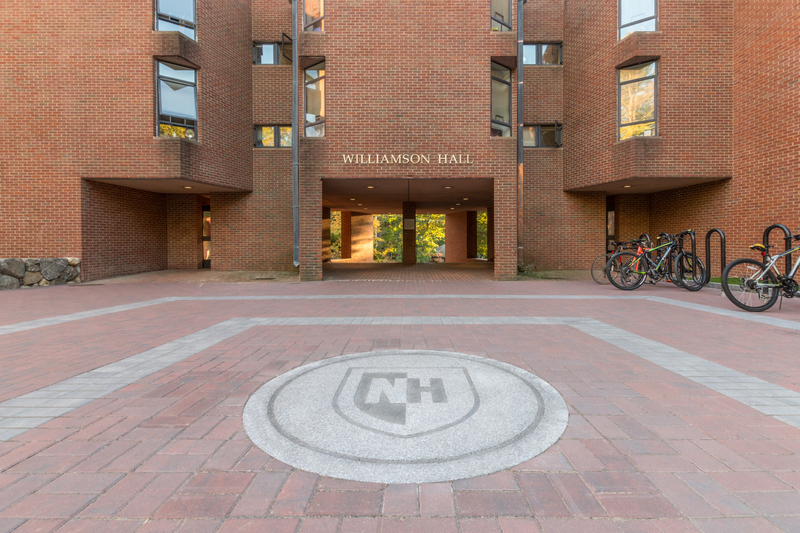 Swenson provided stonework for two UNH Law School signs, and the projects were completed by former local contractor Gus Labrie (deceased). 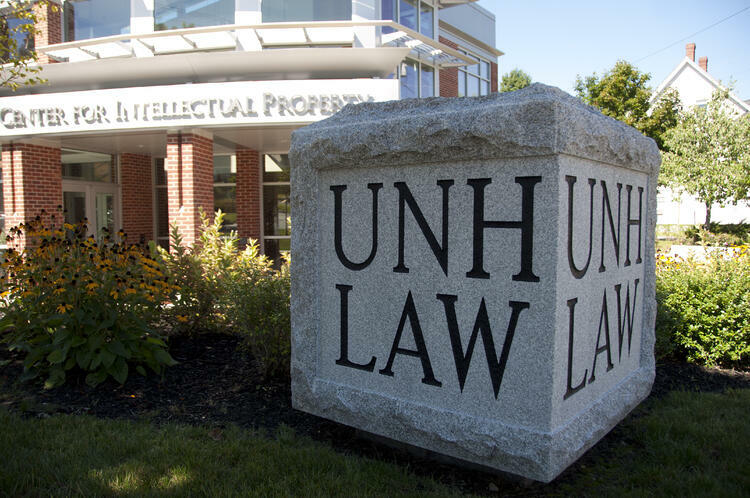 The cube-shaped UNH Law sign sits just outside the stately Franklin Pierce Center for Intellectual Property. Much of the stone work, which used Swenson’s Woodbury Gray granite, was completed onsite. The team sandblasted panels adjoining rock faces edges of the cube to smooth the texture and prepare for engraving. 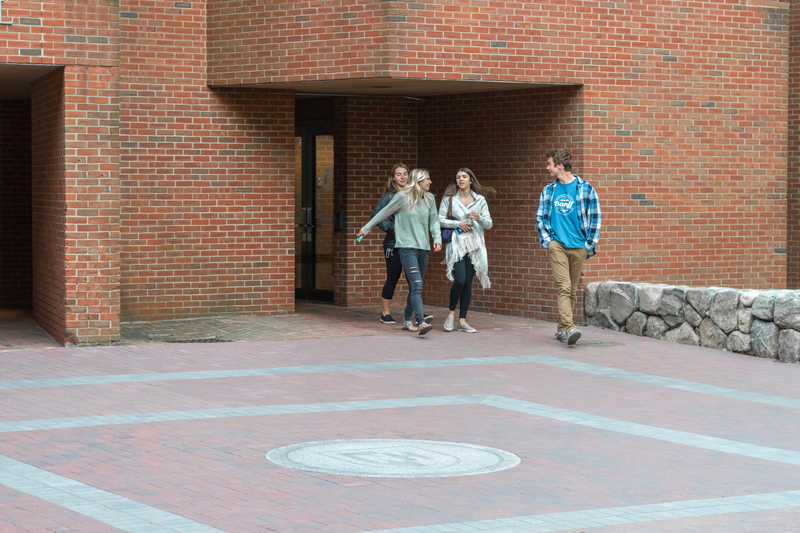 The resulting impression of the school’s name as a cornerstone is undeniable. Next, they completed the engraving process by applying a rubber stencil over the granite, sandblasting the lettering into the stone, and using a lithichrome paint to darken the engraving. 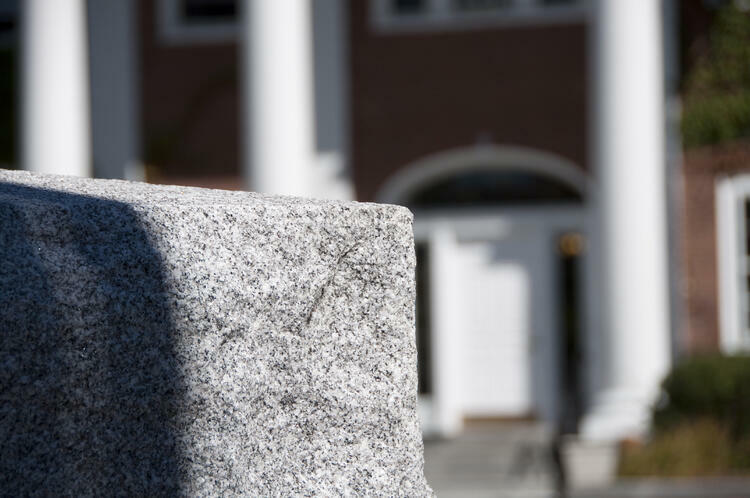 The cube-shaped UNH Law sign is made of Woodbury Gray granite. The large University of New Hampshire School of Law sign also features Swenson’s Woodbury Gray granite on both the wall and cap. The radius granite cap was custom-made to fit the existing fabricated wall. The radius cap was created using a template to fit the stone veneer. Detailed view of the Woodbury Gray granite cap. The pillars on each side of the sign feature an apex top. A lot of handwork is required to create this effect; from rolling the posts, to guiding the saw, to refining the lines by hand with a grinder. The results speak for themselves. From the radius granite cap to the apex tops of the side pillars, each piece was customized to fit the existing structure. The apex tops were cut and refined by hand. Swenson’s granite roadside curbing in Concord Gray was used to make the planter bed beside the asphalt in front of the sign. 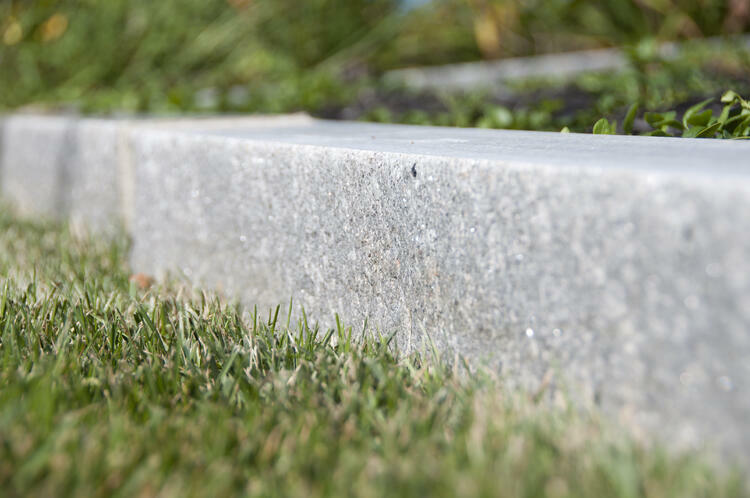 Detailed view of Swenson’s Concord Gray granite curb. 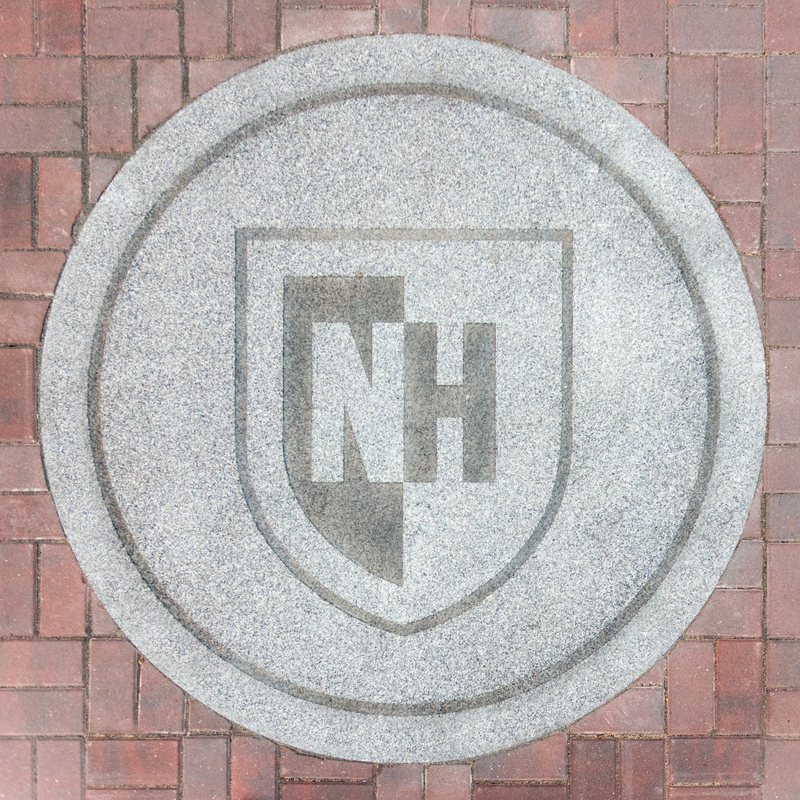 Led by contractor Ben Woods of Eliot, Maine’s Site Structures Landscaping and architect Robbie Woodburn of Newmarket, New Hampshire’s Woodburn & Company Landscape Architecture, Swenson’s granite was used to create the New Hampshire shield outside of Kingsbury Hall and other buildings at the University of New Hampshire’s main campus. The Woodbury Gray granite circle is 5 feet in diameter. The Swenson Granite Works team had to cut the circular shield design with nearly perfect precision so that Site Structures could set the large piece of stone into the patio area and maintain the desired dramatic effect. The sign features custom paint through a process called bluing, which differs from a lithichrome paint process. Bluing is an epoxy-based application that absorbs into the granite, creating a more permanent application than other paint options. “With bluing, we typically like to do it on granite items that are set in a horizontal application,” explained Ames. “With standard lithichrome painting, when set in a horizontal application, we found the paint can peel out over time due to foot traffic and from chemicals, like salt." This granite circle is 5 feet in diameter and had to be cut precisely to fit the surrounding brick border. Standard Woodbury Gray granite pavers also border the brick around the sign. Students make their way across the patio outside of Kingsbury Hall. Swenson’s granite and the shield design are also featured outside other buildings around campus, such as Williamson Hall and Christensen Hall. 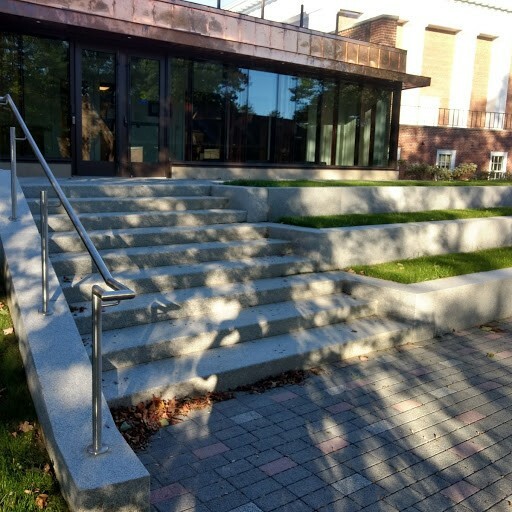 When the University of New Hampshire wanted to upgrade the entry steps outside of Kingsbury Hall, Swenson manufactured a set of granite steps that provided both a beautiful aesthetic for the exterior of the building and excellent durability to withstand harsh New England winters. Swenson created approximately 40 thermal top and thermal edge granite steps leading up to the building entrance. The steps needed to be cut with extreme accuracy because they were being installed between existing concrete retaining walls. “Customers look to Swenson Granite Works for a granite product because of its longevity… It’s something permanent that will add character to the whole area,” Ames explained. 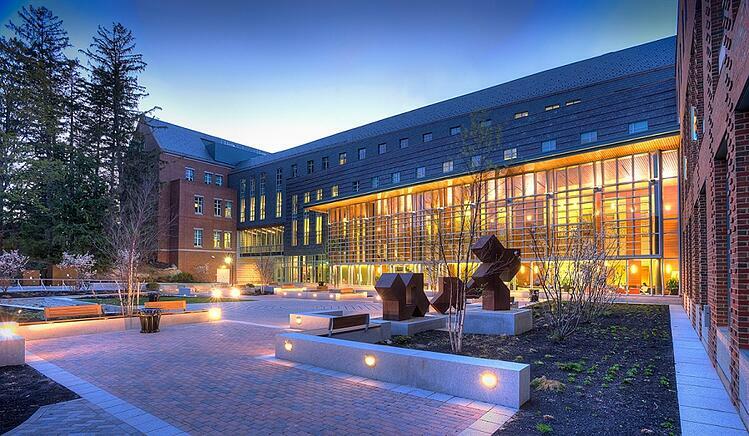 “One of my favorite projects at UNH is the Paul College of Business and Economics,” said Ames. Despite being a challenging project, the end result was a stunning outdoor gathering place for students. The project required many rectangular seating walls, as well as a water runoff swale that was incorporated into the seating walls. 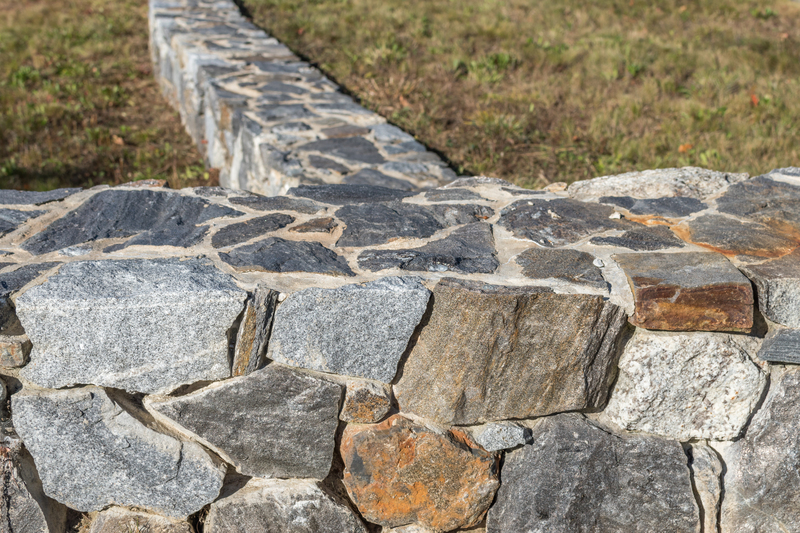 Since the walls were so large, 4 to 6 sections of granite were often needed in order to create a single wall. It was exceptionally challenging for the Swenson team to incorporate the electrical work for the lights into the granite. The electrical wiring ran up from the bottom of the seat walls and turned 90 degrees to meet the light fixture on the front face of the seating wall, so the manufacturing team had to carefully cut holes for the electrical wiring so lights could be mounted into the benches. “It’s quite amazing when you think about how they’re getting the granite from the quarry and the hours that the guys put in making these products and the pride that goes into it. That school is going to be there for decades, and kids will be studying and hanging out at that park for decades. It’s awesome to be a part of those projects that my kids and grandkids may be sitting on in the future,” said Ames. 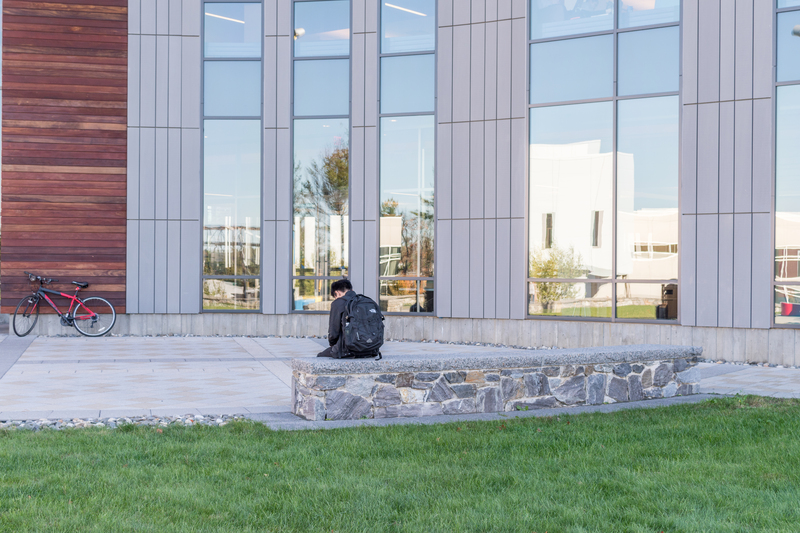 Swenson’s granite walls create a beautiful seating area and gathering place outside of the University of New Hampshire’s Peter T. Paul College of Business and Economics. 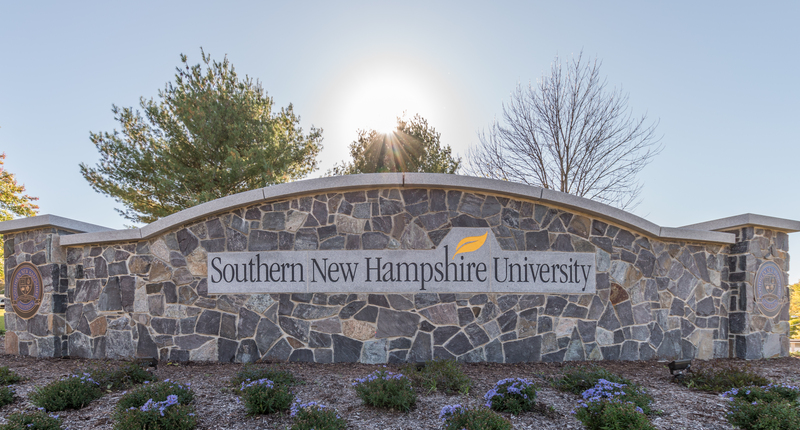 As they have grown their campus throughout the years, Southern New Hampshire University (SNHU) in Hooksett, NH has called on Swenson several times to provide high-quality stone for renovations and additions. 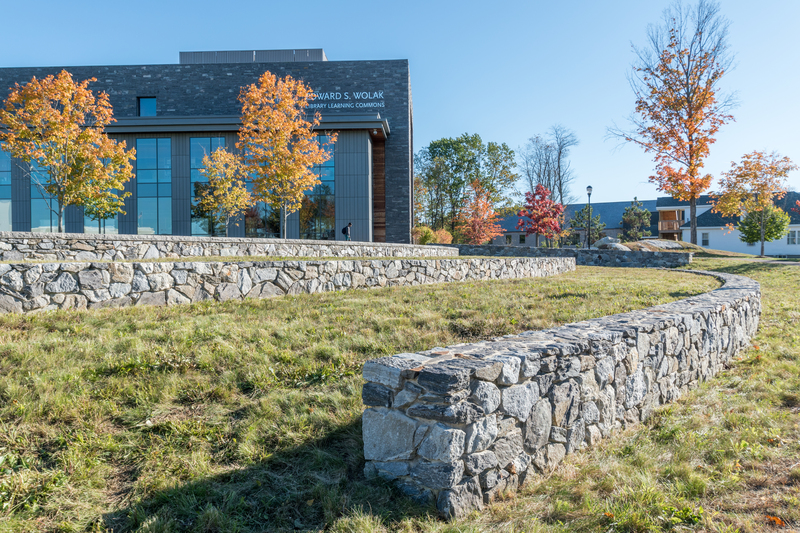 Southern New Hampshire University’s Shapiro Library is a landmark at the school, and the stone walls outside provide both aesthetic appeal and structural function to the surrounding environment. 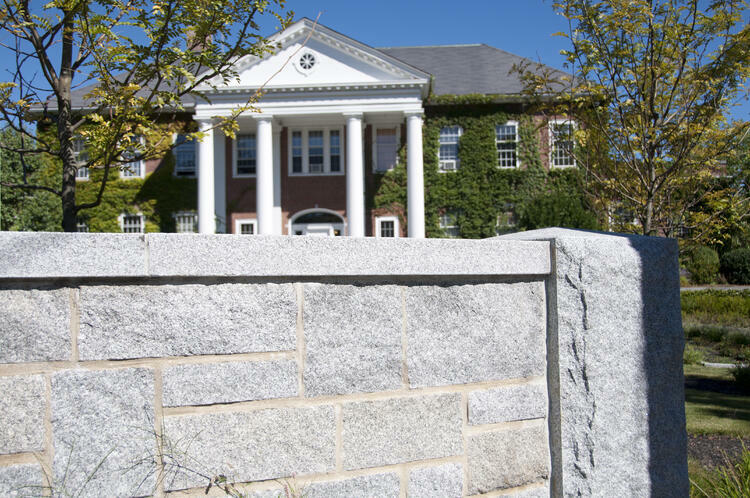 Stone walls outside of the Shapiro Library at Southern New Hampshire University made from reclaimed rock that was harvested from blasting for the new library. 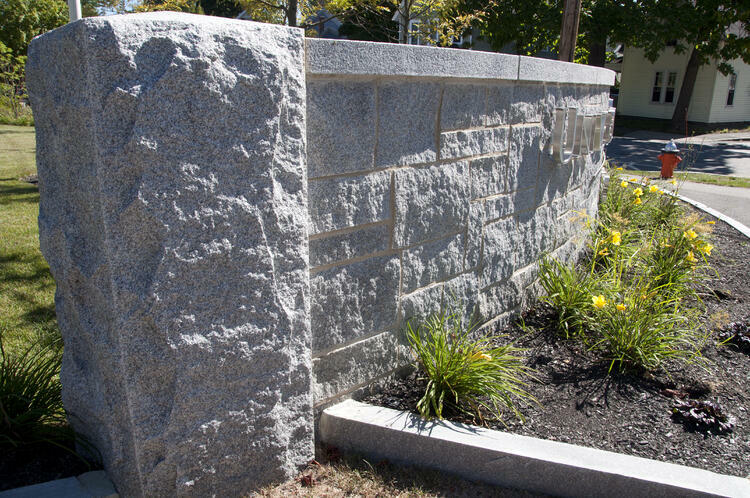 As part of a project led by Laconia, NH-based contractor Mas-Con Corporation, Swenson’s Caledonia granite wall caps were installed over the sitting wall outside of the library. Swenson also manufactured the Caledonia pavers that line the outside of the sitting wall. The pavers were purchased and installed by Brochu Nursery and Landscaping from Concord, NH. Swenson’s Caledonia granite wall caps and pavers complete the sitting wall outside of the Shapiro Library. Students enjoy sitting on the wall outside of the Shapiro Library. 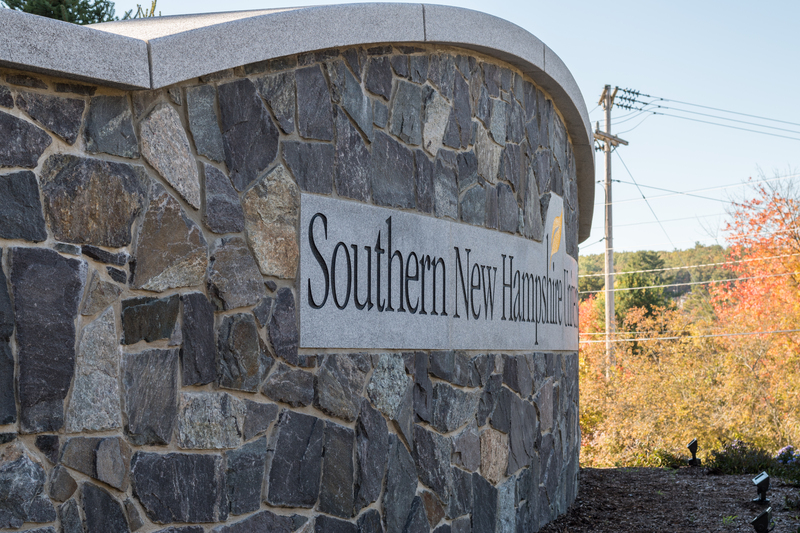 Swenson was excited to provide the granite for both the granite cap and the engraved panel of one of Southern New Hampshire University’s first entry signs. 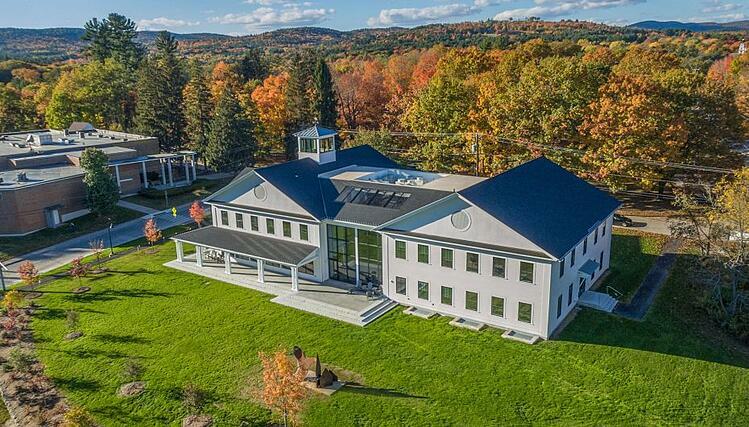 The project was led by Paul Nowak of George W. Pynn Masonry from Plaistow, NH and the general contractor for the project was Harvey Construction of Bedford, NH. Due to the curve of the sign, manufacturing and installing the stone was a complicated process. The top cap is curved from the bottom to top, as well as from the front to the back, so it required much greater detail and precision than most projects. “Each piece has to be made within 1/16 of an inch for the application, because if one piece is off, it’s going to throw the next piece off because we have those radiuses,” explained Ames. The joints where each cap meets the next also needed to be manufactured and installed with tremendous precision. The radius curve of the sign required precise manufacturing and installation, but the end result was well worth the challenge. After the stone was cut and installed, the team moved on to the engraving process. The stone panels for engraving were also curved, requiring Swenson to join multiple pieces of granite together in a way that didn’t interfere with the engraved letters. The team used a contour wire saw to cut the pieces with great accuracy. “With the actual engraving we had some fun with this because that yellow is a precise color — it’s called SNHU yellow. It’s their specific yellow paint. We had to have that paint custom-made for them so it matched their coloring,” said Ames. 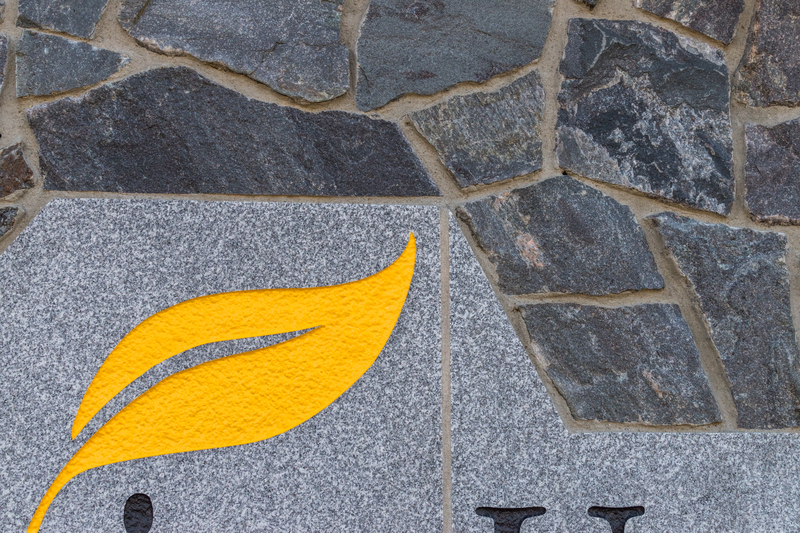 Engraving on the granite panel, as well as the custom SNHU yellow paint. Swenson worked closely with both Pynn Masonry and the University to ensure that the dimensions of the stone were correct, as well as the alignment of the engraved letters over the stone panel. The most challenging aspect was making sure that the panel was installed and engraved in a way that made it appear as one solid piece of granite. 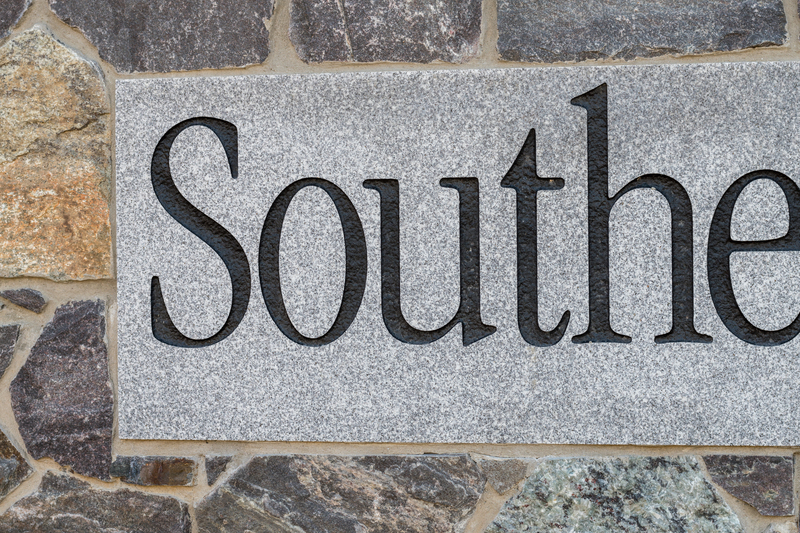 Southern New Hampshire University sign featuring Woodbury Gray granite for both the granite cap and the engraved panel. The panel consists of several pieces of granite that were cut and installed for a seamless appearance. 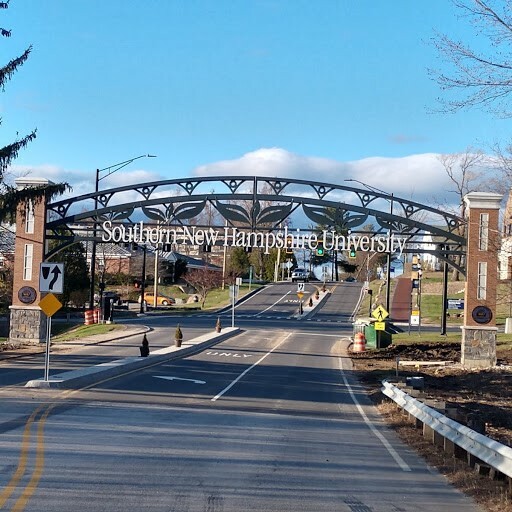 The entryway to Southern New Hampshire University is marked by an elaborate entryway to the campus featuring Swenson granite caps and panels. Swenson granite caps and center panels add complexity to the elaborate entrance of SNHU. Swenson cut the large 5 foot 6 inch square caps at the top of the pillars with a contour wire saw. Initially, the plan was for the caps to be made of one solid piece of granite, but due to weight restraints, the caps had to be made of four separate pieces joined together to appear as one solid piece of granite. The caps were over 5 feet wide and had to be installed in four different pieces due to weight restrictions. 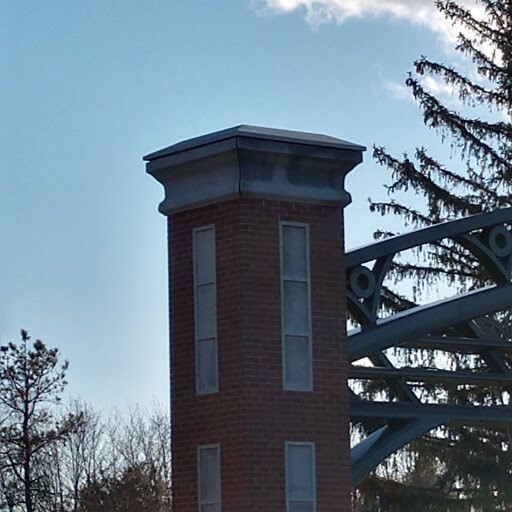 The center panels on both pillars are made of solid Woodbury Gray granite and are 6 feet in length. They are manufactured similarly to a granite sign in that Swenson cut a rectangular piece of granite, covered it in a rubber stencil, then sandblasted each individual recess in the panel to make a single piece of granite appear to be three different pieces. The center panels and caps add complexity to the brick pillars. 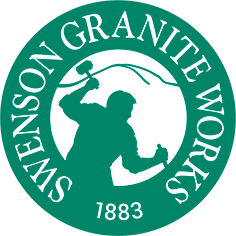 “There are so many great projects that all of us have been associated with at Swenson Granite Works and it’s humbling to think of everything we’ve been a part of, not just around New England, but all over the world where we’ve made things with granite because they wanted it to be there forever. This gateway sign is more than likely going to be there for decades and it’s pretty amazing,” said Ames. St. Paul’s School is a local private school in Concord, NH that was founded in 1856. 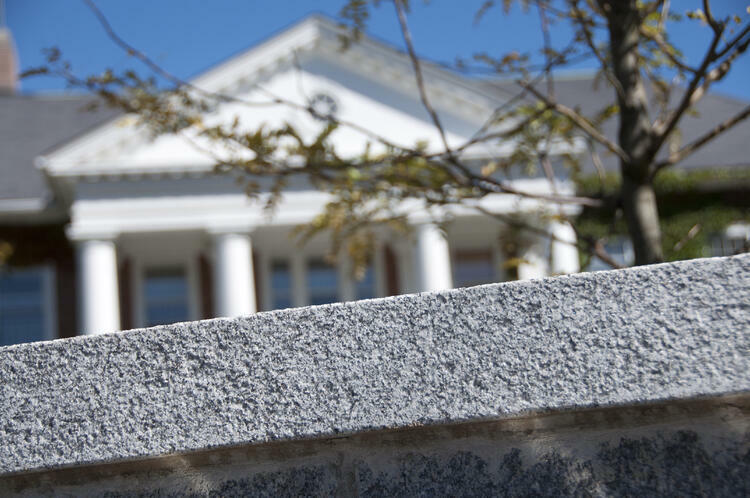 When contractor Brochu Nursery and Landscaping from Concord, NH began the job, they called Swenson to help create a set of granite steps and a wingwall that would be durable and long-lasting while maintaining the beautiful historical aesthetic of the campus. “When you visit St. Paul’s School in person, you can feel the history there, how old the establishment is, and all the different uses of stone within the campus, so it’s a natural thing for Swenson’s granite products to be a part of this,” explained David Duford, Director of Retail Operations for Swenson Granite Works. The steps and wingwall, both made of Woodbury Gray granite, were installed behind the Crumpacker Gallery as a seating area for students. Each step behind the wingwall and seating wall benches had to be cut and manufactured as accurately as possible to prevent the extra time and cost of cutting them onsite. Swenson’s Woodbury Gray granite creates the steps and wingwall at this quaint sitting area outside of the Crumpacker Gallery at St. Paul’s. 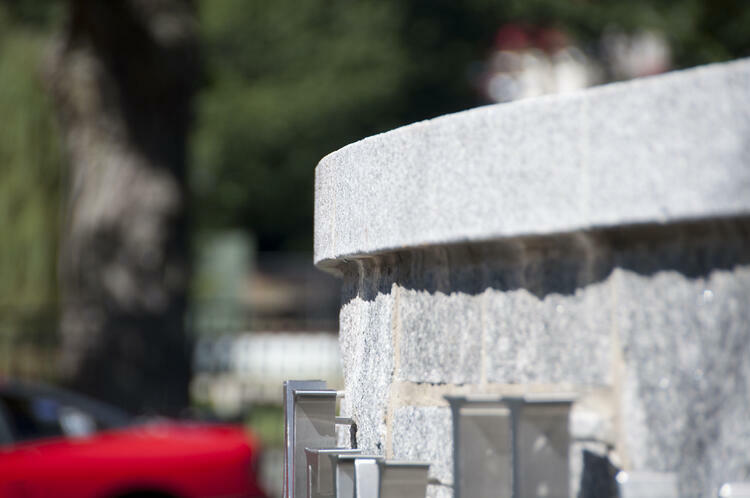 In order to keep installation time and costs minimal, Swenson’s team had to be precise in the cutting and manufacturing of the granite materials. Swenson also manufactured a Deer Isle granite patio for the school’s math and science building with Brochu Nursery and Landscaping. 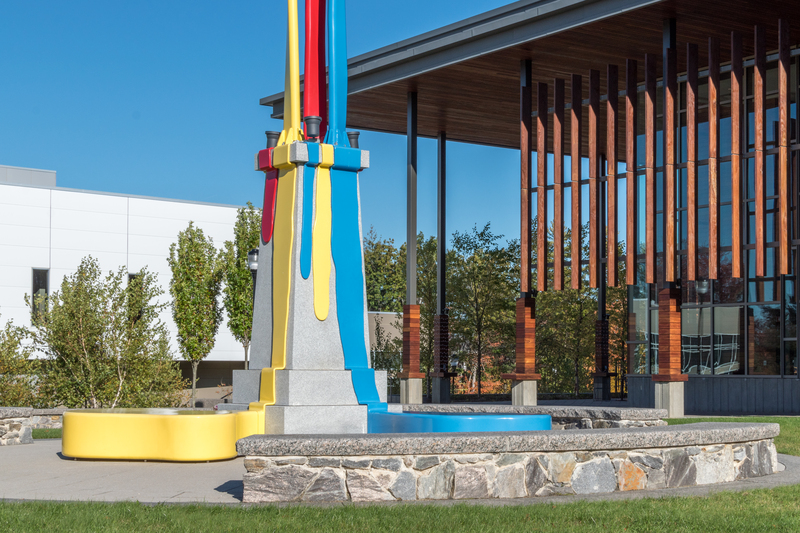 In another project with Brochu Nursery and Landscaping, Swenson’s granite was used at the Lyons Center at New England College in Henniker, NH. The building showcases Woodbury Gray granite steps and a large seating area patio, as well as a bluestone patio. Like the other projects, this used continuous granite steps that needed to be cut precisely in order to make an exact length. 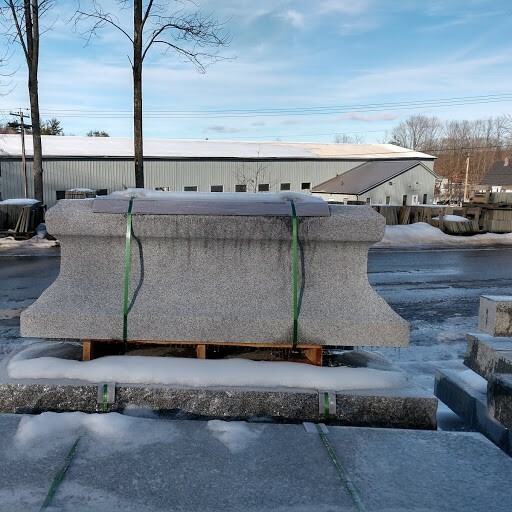 New England College called on Swenson to manufacture durable granite steps capable of holding up against extreme New England weather. “We make products that are going to last for generations and withstand the harsh winters that we have here,” said Ames. 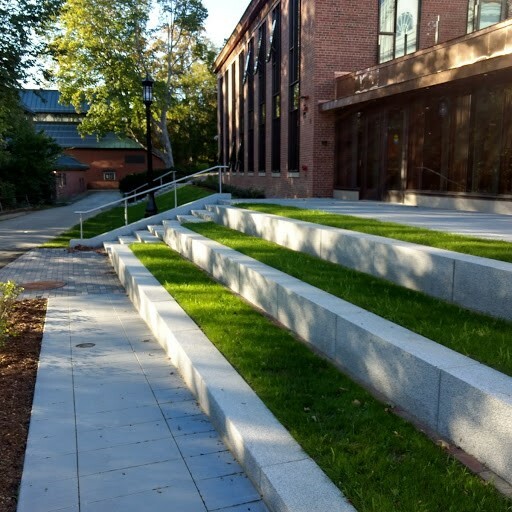 Swenson provided Woodbury Gray granite steps, a granite seating area patio, and a bluestone patio at New England College’s Lyons Center. The project was led by Brochu Nursery and Landscaping. In the past few years, Swenson has also produced seating walls for the campus, creating a welcoming outdoor seating area for all to enjoy. “Open air spaces have become very popular. We’re seeing a lot more outdoor classrooms and amphitheaters where schools can get students outside to enjoy the fresh air. And they call on granite because it will handle the rough conditions that we have here,” explained Ames. At Plymouth State University in Plymouth, NH, Swenson manufactured a beautiful granite entrance for the ALL Well Center. The project consisted of at least 30 thermal edge steps leading up to the indoor track facility, with multiple landing areas made of granite pavers. One side of the staircase is straight while the other side is angled, growing narrower towards the top to create a fanned effect. Since the stairs were designed this way, the angle and length of the granite changes for each step, requiring the Swenson team to be precise in their measurements in order to simplify the installation process and create a fantastic end result. When asked about the production process, Ames emphasized the critical—and difficult—role of manufacturing each piece. “I don’t know that I can give enough credit to the guys at our production facility — it’s such a great team to be associated with,” said Ames. Interested in bringing the beauty of granite to your home, business or organization?  Visit your local Swenson Granite Works store for more information. Download the Swenson Sign Book to review pictures and sample specs of civic, corporate and religious signs we’ve made for customers. See examples of edge and leg options, hand chiseled details and logo engraving.